Tired of making Tater Tots and chicken fingers? 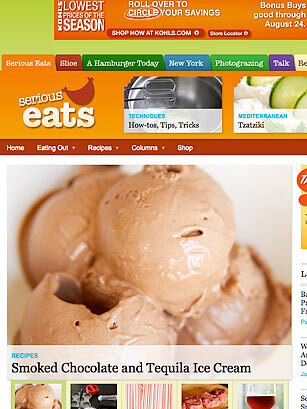 Then turn to Serious Eats for community-inspired recipes, videos and blog conversations about all things munchable. Read about oatmeal ice cream from Washington, D.C., and how to throw a lunch-lady potluck when the kids go back to school, or learn how to make grilled corn with chili-lime butter  yum. The recipes will satisfy even the picky eaters in your house, though you might ask before serving up grilled kimcheese (as in kimchi) sandwiches at the next family barbecue.